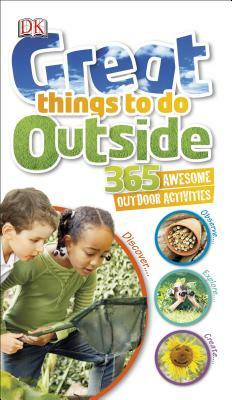 Get kids away from the TV, unplug, and step into the great outdoors with Great Things to Do Outside. Consisting of practical projects to do outside ranging from simple observation activities like bird watching, hunting for fossils, observing air power, and forecasting the weather, to more ambitious projects like making your own wrapping paper, growing crystals, raising caterpillars, and even building a dam, every activity uses readily available materials such as paper, pens, sand, and soil, and includes step-by-step photographic instructions. The flexi-bound format makes it easy to pack for weekend getaways, camping trips, or to carry along on nature walks and hikes, and there are projects in the book appropriate for any type of weather or climate. Specifically designed to be user friendly for children ages 5 and up, Great Things to Do Outside will open their eyes to the nature on their doorstep and allow them to engage with it.